The weekend came around as usual and we needed to get around 12 of the camera's out of the 16 in the field so we could change them over to daylight saving mode. It was a bit of a mission as it turned out quite warm so the cuppa and cake back at the truck went down a treat. Back at Beeman's we checked the memory cards to find little movement on the camera's despite a lot of sign about in general. We figured it was getting a bit dry and the animals were sticking to the good feed areas at the moment. After lunch it was back up the forest with Neil, Beeman's son, coming along this time as he wanted to adjust the Old Swaro Z 6i he now had on his 7mm 08 out to at least 300 m and go for a hunt later in the evening. The zeroing session took a while but we finally got there and at about 4.30 pm we took off to the spot Neil wanted to check out in the evening, a nice grassy block with young pines next to a mature stand of pine, an area he had wanted to look at for sometime. Beeman and I took off to the "Lookout" as there still appeared to be sign around on a lot of the dirt patches and after our big walk in the morning a relaxing sit on the hill was quite inviting. It was after 6 pm when we got to our area so we headed up to the "lookout" for about an hour and a half's glassing around the bush edges. About an hour in I noticed Beeman move to look down over the side of the hill we were on, down to the road we were parked on, a few minutes later a shot range out but it didn't sound like a hit. Quickly I grabbed the rifle and headed over to him, I could see him aiming so waited, watching in the bino's where he was pointing bang again this time a good thump came back. I picked the animal up about 140 yards away down but thrashing it's head about, it was a stag and a good looking one to boot. Next thing I seen the stag standing although he was rather wobbly so I said to Beeman shoot him again, in the neck which he promptly did dropping the stag like a sack of spuds, the 143 gr ELD X passing through the thick neck. I said to Beeman that's a nice sambar stag you just shot it looks a bit like PD knowing it wasn't as he resides a long way from where we were right now. Beeman replied nah it's a spiker I seen it cross the road then start feeding it's way up the hill. I said again you are wrong man it's a good looking Sambar. 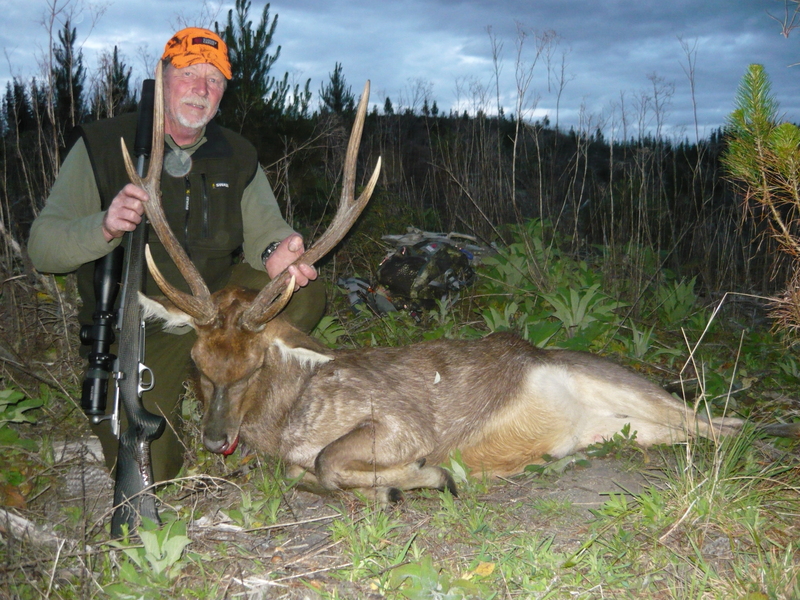 Darkness was coming so we grabbed our gear and went down to check the "spiker" out.....as we neared the down animal we both realized this was something unexpected it wasn't a spiker, it wasn't a Sambar stag but what it was we would never have guessed it was a Very nice Rusa Stag. The area we were hunting is only separated from Rusa country by a major river so we figured this stag at some time had been chased by pig dogs and swam the river to evade them thus ending up where he was now. He looked real good so Beeman decided there and then to get it mounted, Rusa Stags don't usually come along like this one that often. Beeman started head skinning after photo's and darkness was almost upon us. I took off to get Neil which was close to an hour there and back. Neil had seen two red skins come out right on dark and they feed into a gut he couldn't see into so by the time he moved the light ran out so he left them undisturbed. The plan was to have another look on Sunday arvo. We got back to Beeman and clambered up the clear cut across heaps of old slash but as luck would have it, it wasn't far. Beeman had finished head skinning and had the stag gutted ready to drag down to the road. Five minutes later and the hard work was over. 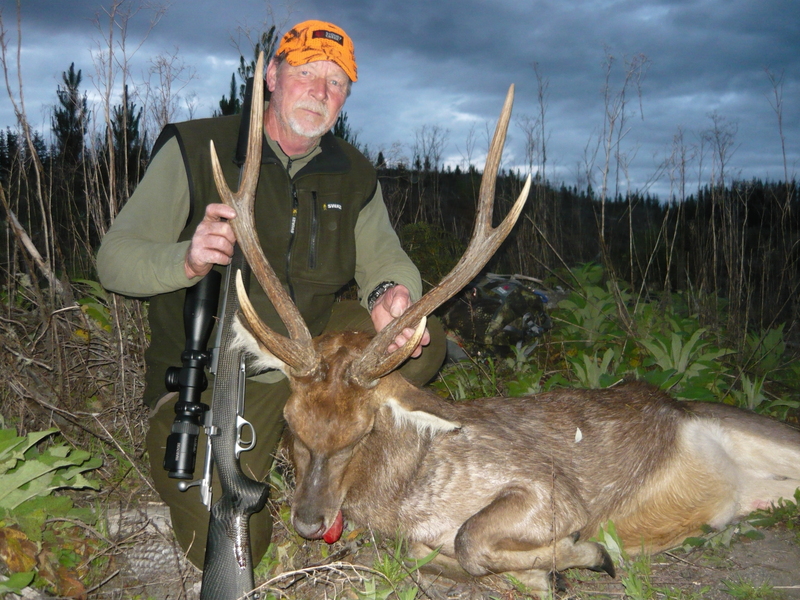 Beeman had the stag officially scored on Sunday (today) and it went 163 6/8 DS putting it into the record book, 160 DS is the entry level for a Rusa Stag. What a magic day on the hill, even though we are knackered today I wouldn't trade it for the world. A great day with good mates and an unexpected prize that's for sure. Wildman, Tahr, outdoorlad and 34 others like this. he's a ripper alright...well done indeed. Well done again you guys. @Mooseman I reckon you had better hurry up and get that book out. With stories like this its bound to be a ripper !! What a FANTASTIC spot you guys like in... possums a plenty, several species of deer and even wallabies. veitnamcam, Mooseman and BeeMan like this. We sure are lucky, it would be a dull life if our game animals were eliminated , that is why we must stand up to those who threaten our sport. Imagine playing golf all the time? A good walk ruined they say. Waste of a perfectly good motocross course.